It was the run up to Christmas 2015 and a ten minute drive from home to the historic city of Durham, also known as Land Of The Prince Bishops. Another night out with my new Sony a7s mirrorless camera and further hands on experience in low-light conditions. Up till this point the Sony had only been given a couple of outings - the last one being a notable cloud-out on the Northumberland coast at Dunstanburgh, searching for that elusive Aurora. The other occasion was a lot more nearer to home at the Copt Hill Barrow, Houghton le Spring, when big winds was the major factor in shutting up shop early. The Dunstanburgh outing was a testing affair too, as far as the camera goes. Very low light conditions pushed the Sony to it's limits and focus issues were a major factor, plus the battering winds didn't help matters, so I came away from that experience with the thought of 'keeping at it' as I was yet to see exactly what this camera was capable of. So off to Durham it was. The riverside path near the Framwelgate Bridge was the first port of call, mainly due to the fact that I had parked nearby and it seemed an obvious starting point for tonight's photography trip. The first shot I pulled in can be seen above, at the edge of the River Wear, shooting across towards the lit castle, perched high on the river bank. The water level was as high as I'd ever seen it, threatening to breach the banks altogether, but for now I was safe in the knowledge that the riverside path was dry and accessible - for now! As the river was very high and flowing at a rate of knots, the noise from it was not to underestimated, so I kept a close eye on each step I took, not wanting to fall victim to an aggressive current. 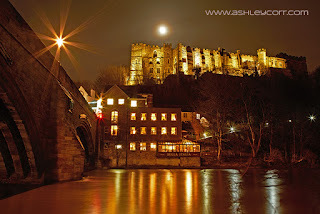 In recent times the river in Durham City Centre has mysteriously claimed the life of a handful of people, under darkness and still to this day remaining unexplained. I certainly didn't want to become another statistic, so I kept my wits about me. Setting aside the perils and pitfalls of the river in front of me, the scene was crying out to be photographed. 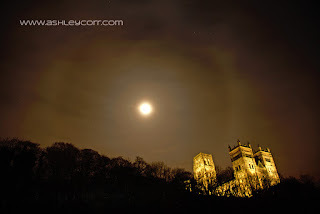 The almost full moon shone above Durham Castle and the sound of Christmas Carols could be heard nearby. A perfect setting at Christmas, with the ideal music to accompany it - all that was missing was the snow. From there I made my was along the riverside path towards Durham Cathedral. As I looked across the river to my left my eyes were immediately drawn to the Lunar Halo surrounding the moon. Now, this I just had to photograph. A natural phenomena that I had only seen a handful of times previously, but this time I was fully equipped and ready to capture it with a camera. This would be my second and last shot along the riverside, as the path in front of me was flooded by the river and completely out of bounds. Ah well, not to complain, the night has started well and the Sony was pulling in sharp, colouful shots at ease. The manual focus peaking is a major feature on the a7s and it worked brilliantly, making my job far easier and almost effortless. All that needed to be done was to compose the shot and nailing the exposure, which was fairly straightforward. A walk over Framwelgate Bridge and up the bank took me past the shopping precinct and into the Market Square. 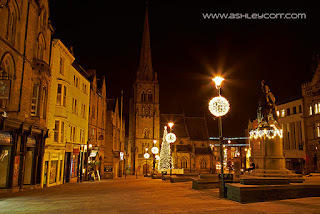 It was quite busy, with groups of folk enjoying a pub crawl, as well as the last few shoppers before closing time. I ran off one or two long exposures, missing out the moving figures, so the Market Square actually looks quite desolate on this shot, despite the fact that the place was quite active. Then it was time for Fish & Chips at Bell's restaurant and takeaway. Possibly the best I've tasted, washed down with Coca-Cola. Very nice indeed. And what better place to finish off than Durham Cathedral. Palace Green was deserted. 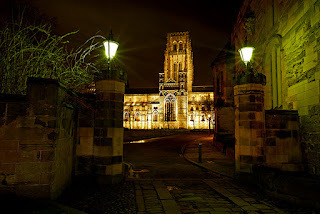 The obvious viewpoints stood out, like the entrance to Durham Castle and its converging path towards the main gates, plus the main player which was the majestic Durham Cathedral . I turned the tables on my next shot, opting for reverse shooting with my back to the castle and facing the gates, with the Cathedral in the background. The olde worlde lamps gave the shot that extra bit of character and an almost Dickensian feel to the whole composition. This was a shot with a difference and one I hadn't previously 'seen', despite many visits down the years. Just across the way, back out the entrance to Durham Castle, was a small puddle, with a flat calm reflection. Here is the shot, which I like a lot, I must admit. Again, a different perspective on an iconic landmark. It was an enjoyable photography outing in Durham, at night, at Christmas - a perfect setting. Northern Lights - KP8 Predicted !! !